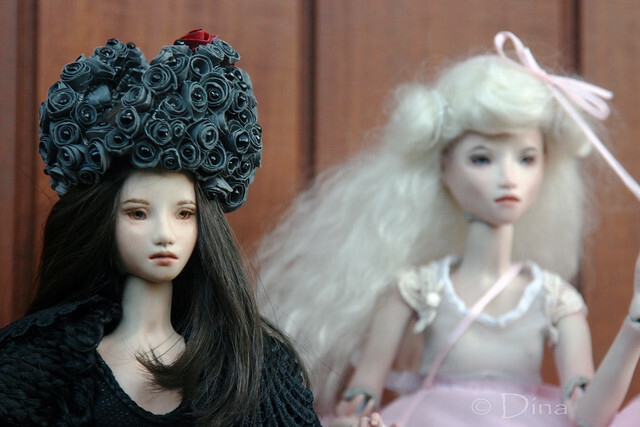 I know I have favorite wigs for my girls, either they came all styled with their wig or I found just the perfect one for her. But as a photo challenge, what happens if you try a completely different wig? A change in the style, length or color. Or something you have never tried before? 3) and a before shot .. we simply gotta compare! This is Kalina (by TinyShirt Randi). I bought her for her original Black Cloud styling and havent brought myself to change from the human hair brown wig she came with. But her skin tone is so unusual an amazing rosy gold, so different to my other girls .. so time to experiment! I found this great pinky gold red curl last year and created a few wigs for my other girls including this one for my Marmite Sue Dentelle, I am constantly inspired by Marmite Sues soft yet eclectic palette. So I tried this wig on Kalina ... and suddenly, Kalina has a new personality. Instead of her usual grunge model persona, she has found her softer, gentle side. Today we see Kalina as a girl in touch with her inner self, a girl not needing to put on an 'image' for anyone. Today Kalina lives up to her name ' in love'.